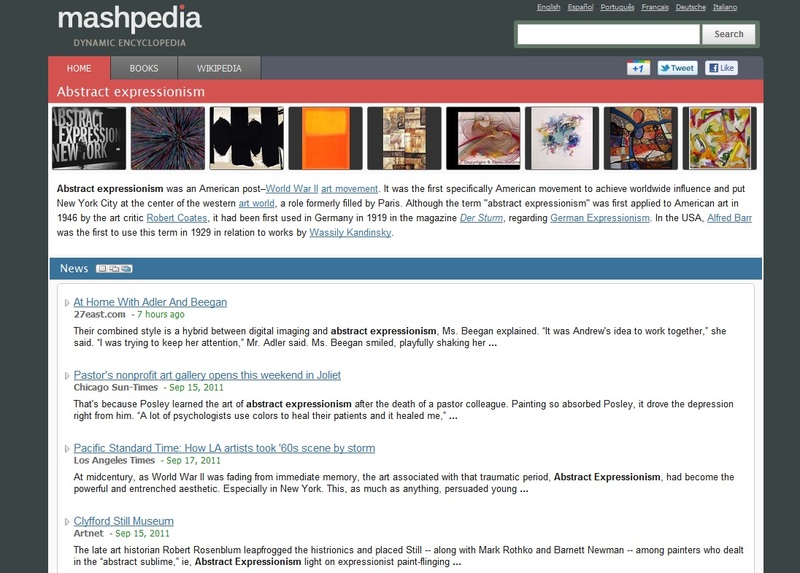 Mashapedia is an aggregator combined with a search engine. Mashpedia is an online encyclopedia comprised of “LiveDocs”, which are dynamic web documents displaying blocks of content related to the given topic, retrieved from multiple sources across the Internet in real-time. If a user types in a concept, it goes to the news, YouTube, blogs, Twitter, Facebook and Qwiki and then compiles everything on one easy to read page. I used it immediately this week with really really current topics. The grade 12 Biology students came in for help trying to find a species of plant or animal that was endangered because of its limited gene pool. We typed “endangered gene pool” into Mashapedia and we were lead to a blog by a researcher identifying some insects that were endangered for this very reason. Posted on September 20, 2011 July 7, 2014 by banana29Posted in UncategorizedTagged digital literacy, educational technology, information literacy, library leadership, literacy promotion, mashpedia, technology integration, transliteracy. I LOVE the look of your blog! If Blogger had anything like it, I’d use it!